Help Generator for Microsoft Access is the fastest way to add Help to your applications. Features HTML page and image generation, table of contents, index and search, images with hotspots and export to Word. The WYSIWYG wizard lets you set many options for page layout and application specific information. Produces HTML Help or web-based help and documentation in Word. Includes state-of-the-art help editor. * links from the help file to your application. 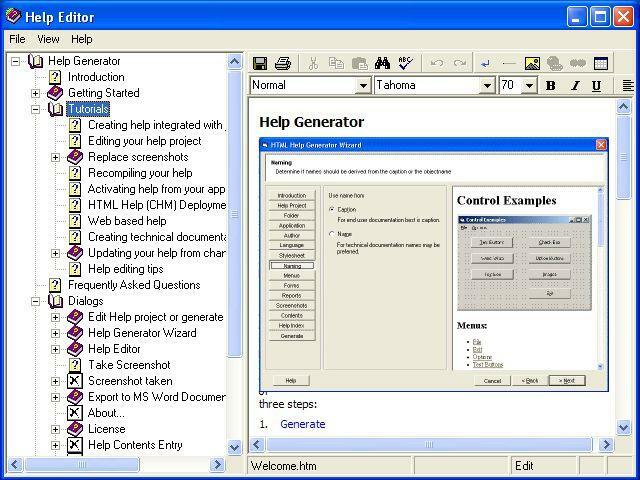 This makes the Help Generator a time-saving help authoring tool both for technical writers and programmers. Help Generator for Microsoft Access scans the application. Each form in your application is analyzed in detail in terms of controls, menu, tab order etcetera and presented as pages with well-formed HTML. In the Microsoft Access version other application objects are additionally processed: reports, tables, relations and queries. Qweas is providing links to Help Generator for Microsoft Access 6.0 as a courtesy, and makes no representations regarding Help Generator for Microsoft Access or any other applications or any information related thereto. Any questions, complaints or claims regarding this application Help Generator for Microsoft Access 6.0 must be directed to the appropriate software vendor. You may click the publisher link of Help Generator for Microsoft Access on the top of this page to get more details about the vendor.